The Desire was a leap for HTC and the Galaxy II the same for Samsung. So how do the next generation do against each other? We look at the new HTC Sensation and the Galaxy S II. The Galaxy II has the honour of being branded the world’s thinnest smart phone and is a super thin 8.8mm. The HTC is wider and heavier than the galaxy but does feel a little better built in the hand – following HTC’s recent emphasis on quality of feel. Looks wise the Galaxy pays homage to the iPhone 4 and the HTC is not a huge leap on from the attractive Desire. The HTC weights 148g in comparison to the super light and slim 116g of the Galaxy. 1.2 GHz dual core processors take no prisoners as you can imagine and both phones come equipped with these chips. The Galaxy is running with 1GB of RAM giving it an edge over the Sensation with 768MB. Both are Android 2.3 phones and the HTC is powered by the latest version of Sense with 3D graphics, whereas the Samsung by the less highly acclaimed TouchWiz interface. Cameras don’t offer much of a difference; both of these phones have 8mp shooters that are exactly the same on screen. The Samsung however des have an advantage with its 2mp front facing camera for face to face talking, whereas the HTC only has a VGA shooter on the front, which is a bit lacking. With both devices having a similar 4.3in screen there is little to choose. The HTC has a Super LED with a resolution of 540×960 and the Samsung uses one of its infamous AMOLEDs which have a 480×800 resolution. The HTC has an excellent screen but AMOLED really does offer an extra level of colour depth and texture and ensures Samsung win the day with this display. One of the weakest things about HTC’s and the Desire HD in particular – another 4.3in HTC offering was the battery. HTC have tried to rectify this with a new 1520 mAh pack. This does help and give a longer life for the HTC. However Samsung have a 1620 mAh power pack and it does increase the battery life longer than the HTC’s. 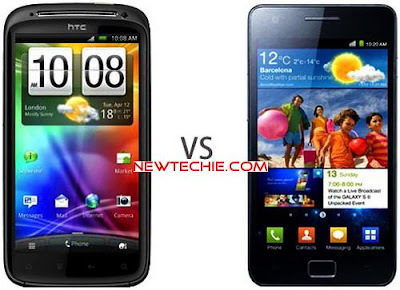 The Sensation and Galaxy SII are the two most powerful smartphone beasts on the market currently, and while they are fairly similar in specs and physical design the Samsung phone does look like it has a slight edge over its HTC rival. However, many people will be drawn to the Sensation for its Sense interface, which has a lot more appeal with potential phone owners than the TouchWiz offering from Samsung.